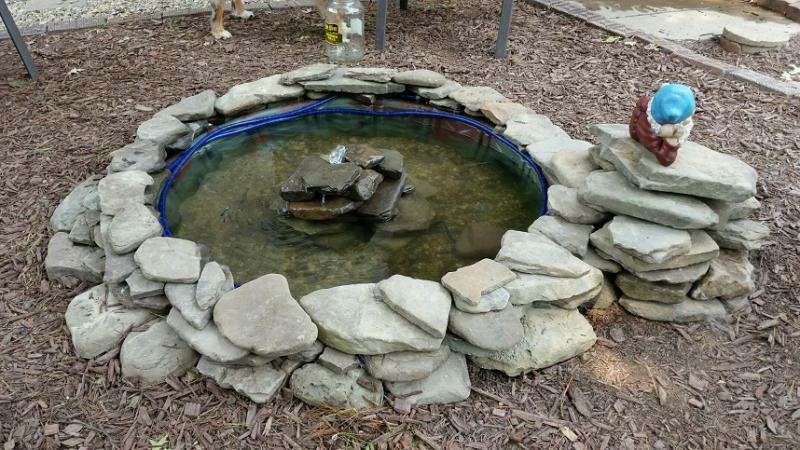 So over the weekend I finished our little pond. It's not big about about 40 gallons but we didn't want anything too big that a child or dog would fall into and get hurt. We are going to see how this one does this summer and maybe next spring building a bigger one. The blue rope lighting is gone we didn't like the looks of it, so took it down. It has a small pump and filter in the center, 2 gold fish and 8 guppies. In a few months we will be moving the fish back indoors to their "normal" tanks. So far everyone is doing fine but I did notice this morning some of the rocks where moved around so I think a cat was trying to get the fish. This week we are going to put some rocks around the inside so you don't see the liner. Do you have it enclosed with a fence? It'd be a real waste if there is some animal trying to get the fish. Our back yard has a 6 foot privacy fence and during the day our dogs are in the back yard. But anything that would dig out the fish will climb the fence after the dogs come in for the night. Other than the one night nothing has messed it, the rocks in the center are just stacked so anything could knock them over pretty easy. We talked about gluing them but we might change them out so haven't yet. Also tonight we are going to pick up a few more gold fish, my wife wants 5-6. We bought three (one of them died) about 6 months ago hoping to get them early so they would grow out to a nice size before putting them in the pond. But they are able half the size we wanted to be by now.